Three people have been arrested in Mbarara for allegedly conducting a mock funeral for President Yoweri Museveni. The three are Albert Nangumya, 20 a student at Bishop Stuart University, Rodgers Asiimwe, 26 and Maxi Muhumuza, a spokesperson of the Ankole kingdom. Police alleges that the trio was found in possession of a coffin with an inscription "Rest in Peace Museveni," and a portrait of President Museveni. In the same coffin, were names of Justice & Constitutional Affairs minister Kahinda Otafiire and several other Members of Parliament. According to police, the suspects were protesting against a ploy to amend the Constitution to remove a limit on the presidential age. 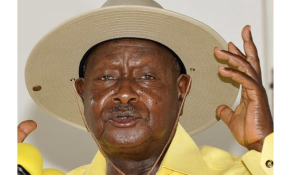 It comes at the backdrop of reports that a section of National Resistance Movement legislators have mooted a plan to amend the constitution to allow President Museveni to contest for the presidency in 2021 and that the constitutional amendment bill on the same has already been gazetted. Under the current provision in article 102 of the 1995 constitution, President Museveni would not be eligible to contest for the seat. Born in 1944, Museveni will hit the limit before the next presidential election. Rwizi Region police spokesperson Samson Kasasira said that the suspects had initially sought permission to hold a demonstration in Mbarara town. However, their request was rejected but they went ahead with their campaign nevertheless. Kasasira says that the police have forwarded the file to the Mbarara Resident State Attorney for further advice on the matter. The suspects are currently held at Mbarara Police Station. They face charges of sedition that carries a sentence of up to five years in prison if found guilty. The case is registered under file number SD 06/06/07/2017.